I hope you are doing good. 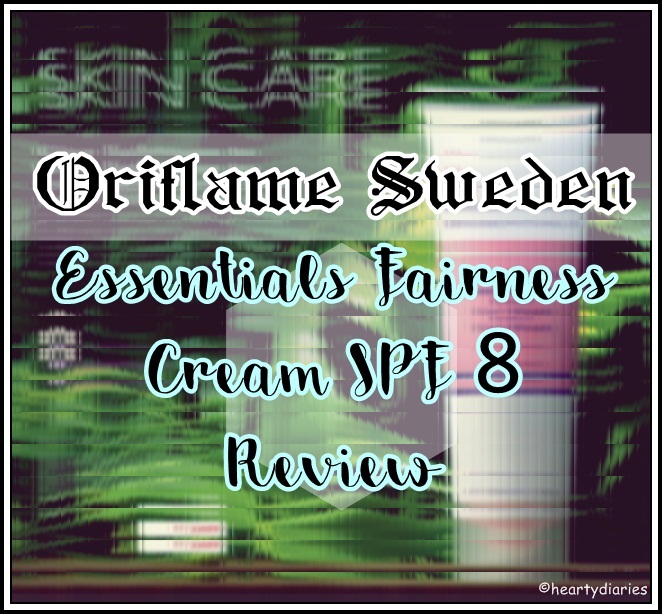 My Oriflame reviews series is almost near the end & today I am going to share my review about Oriflame Sweden Essentials Fairness Cream SPF 8 with you all. Before starting, I would like to put out a disclaimer that I am not a racist. I don’t judge or treat people on the basis of their caste, creed or color. In India, being beautiful still means having a fair color. To be honest, I have always hated the fairness creams ads on TV and I feel that beauty doesn’t lie in our complexion. I literally hate the ads where the girl applies a fairness cream and instantly gets a job or gets respect in the society.. How bad is that, ehh? Beauty is how you are and how flawless and nice your skin is. In India, even the darkest men prefer fair girls and this discrimination because of dark complexion is enough to hinder someone’s confidence. Due to this, some girls blindly trust fairness creams and hope for a complete new self and very fair skin. First of all, its nearly impossible to change your complexion. Second, you are beautiful the way you are and how talented you are. No matter what your complexion is, just take care of your skin and wear confidence as your dress. 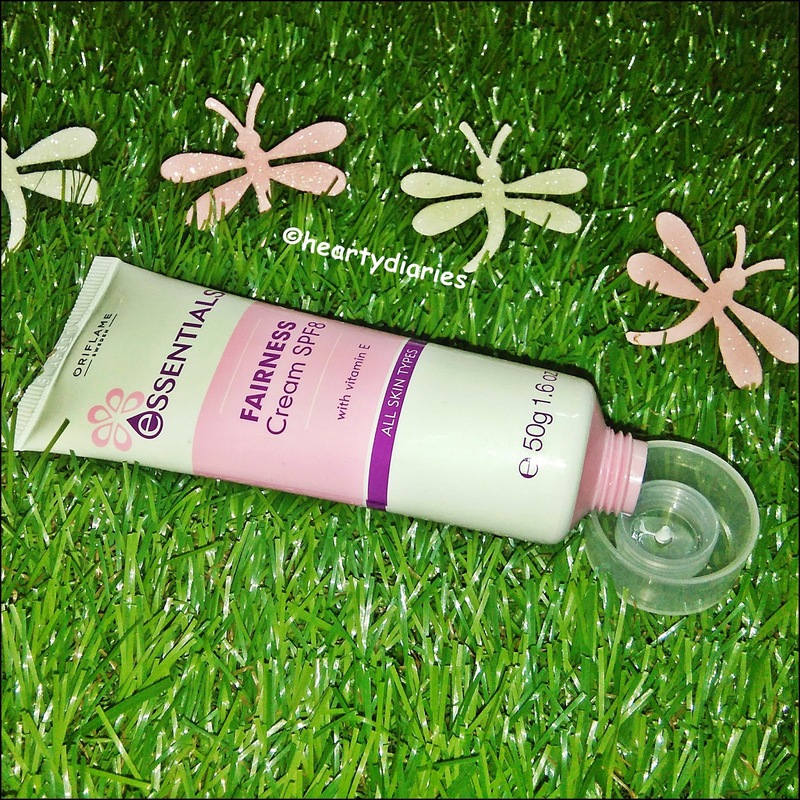 I have quite fair skin and don’t need a fairness cream but the reason I bought this one by Oriflame was the fact that I wanted to include all types of products in my cart and also wanted to see if it could lighten up my acne scars. Plus, the sun protection factor and Vitamin E extract were some things I was really happy about, so I bought this product. I’ve already spoken a lot and without wasting further time, lets get into the review. 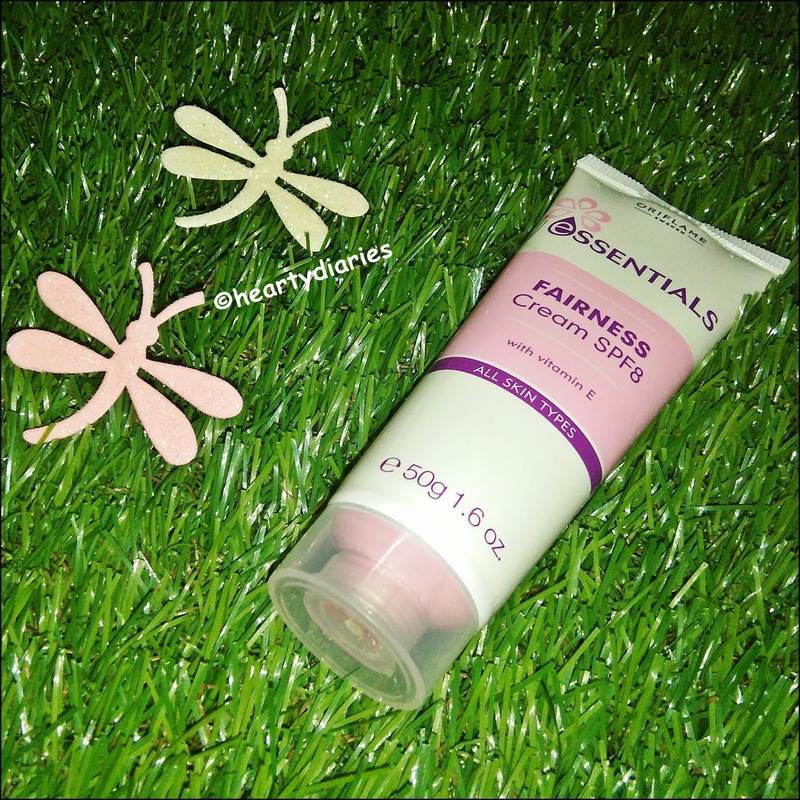 Product Description: Moisturises, brightens and prevents UV-induced pigmentation. Rich formula with skin lightening complex, Vitamin E and SPF 8. Cost: Rs. 169 for 50 g or 1.6 fl.oz. 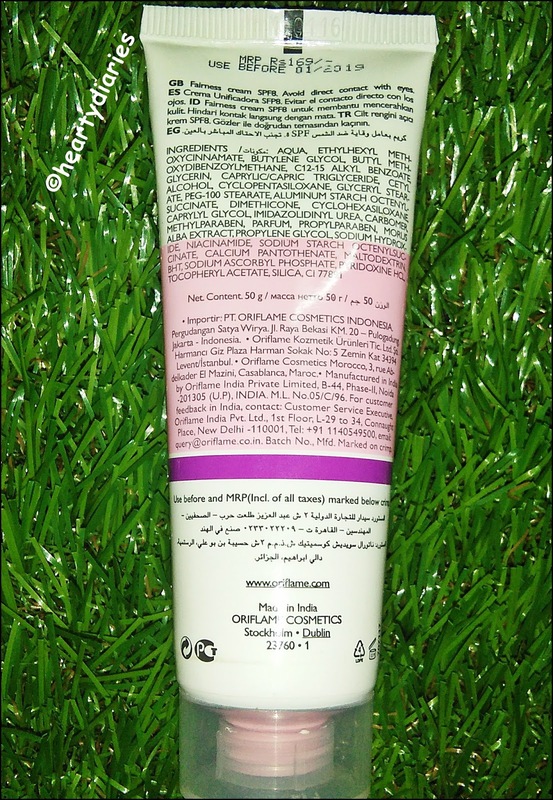 For more, check Oriflame’s Official website..
Packaging: This product comes in a very soft, off-white tube having some pink and purple detailings. It has a white-transparent screw cap and the packaging is sturdy, light weight, travel friendly and leak proof. 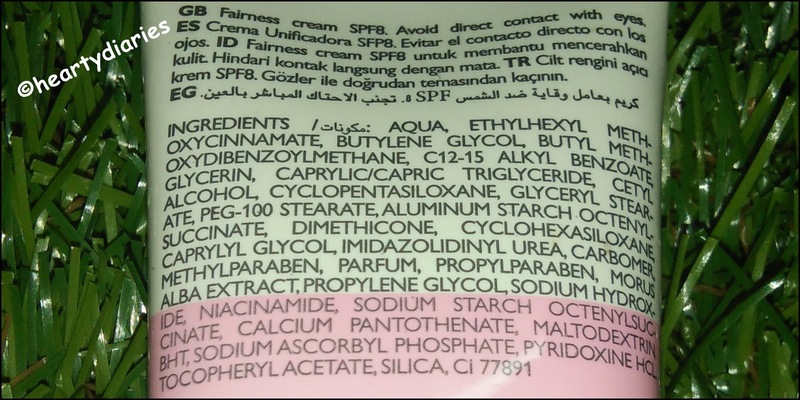 The tube is really soft to squeeze good amount of product out and a lot of information in different languages and ingredients list is mentioned at the back of the tube. Texture and Consistency: This cream has an off white color and a runny consistency. As this fairness cream has SPF 8 in it, I applied it for the first time while heading out in the sun. I really love the fact that it has sun protection factor in it which is really very very important, especially in India. I am very careful while buying SPF products and try not to buy those creams and lotions which have a high sun protection factor. In this case, its the perfect thing. I really don’t opt for high sun protection. Instead, apply the cream again! Coming to the performance of this product, as I said I applied it while going in the sun. 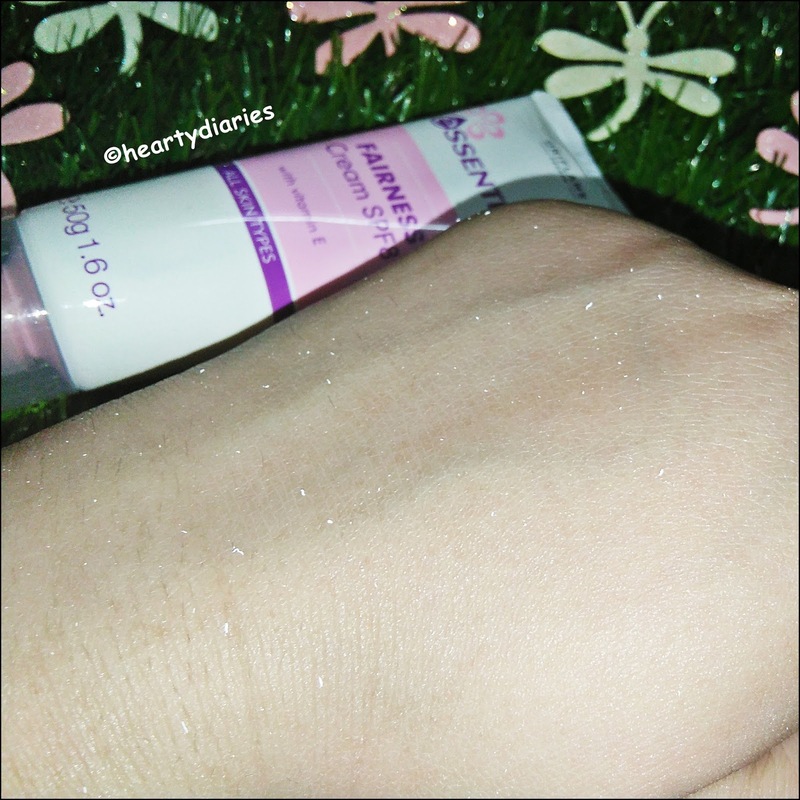 I squeezed the soft tube gently to get an ample amount of product onto the back of my hand and started dotting it on my face. A little amount was really enough and I then started massaging it all over my face. At first it looked extra white but as soon as it got completely absorbed in to the skin, the whitish thing was gone. What I noticed while still massaging it on my face was that the cream started to turn into white rubber-like flakes, I don’t know why. I brushed it all off and was sorted. 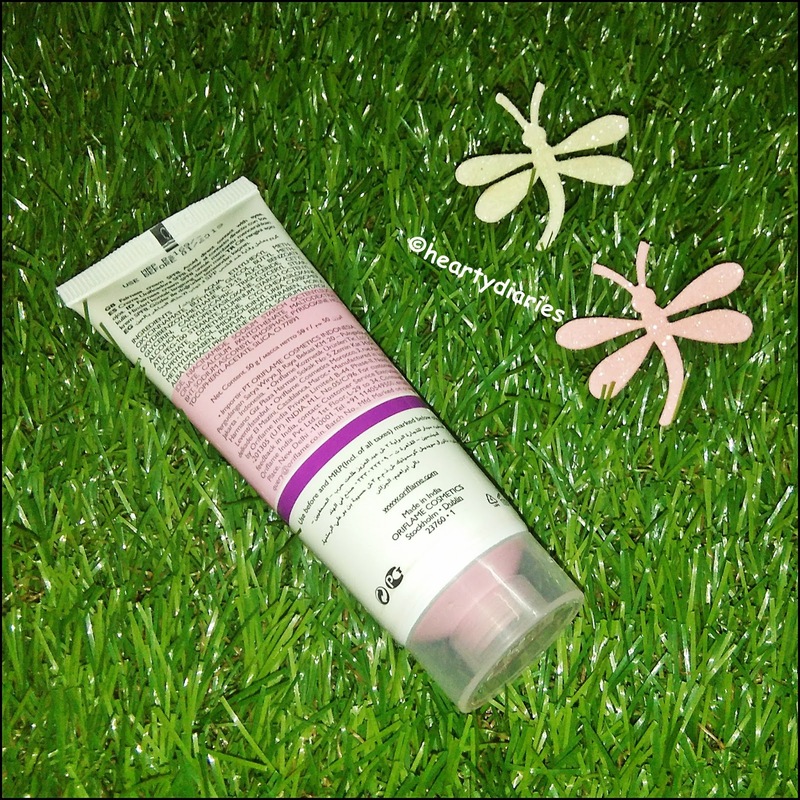 This cream has a gentle formula and provides moisture to the skin along with spf. Due to its hydrating formula, at first my face looked really oily and I thought it was not meant for oily skin but later it looked semi-matte. My face looked nourished & soft and smelled great. 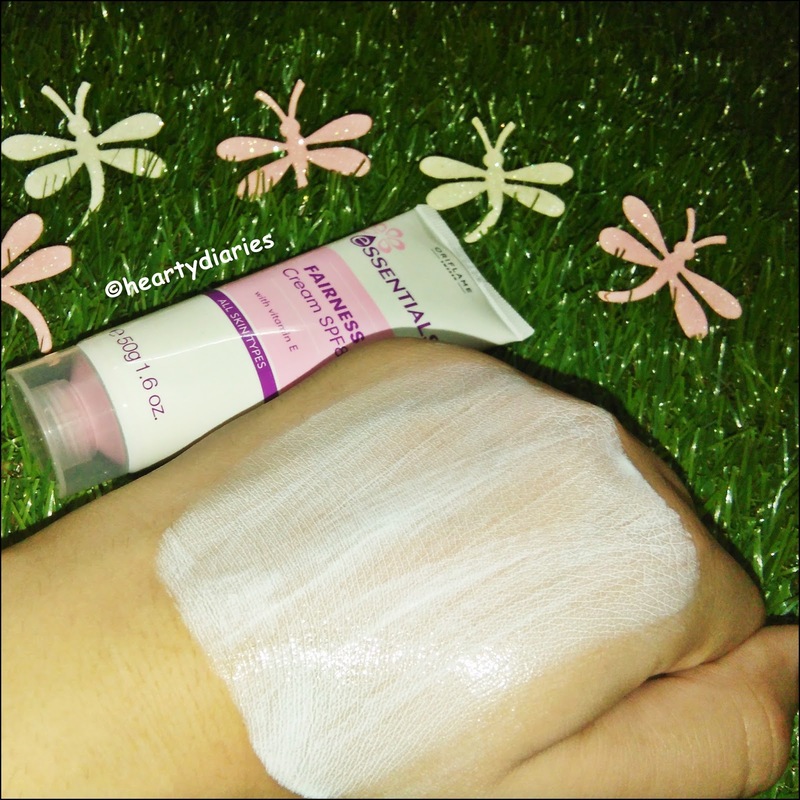 The overall experience with this cream is good in terms of making the skin soft and providing it protection from UV rays and sunburns but I don’t find the exact thing it is meant to do. There is no effect on fairness as claimed. Even though the quality is not bad at all and I love the fact that it is meant for all skin types. My sensitive, acne prone, oily skin hasn’t got any harms from it but it hasn’t got any great results from it as well in terms of color improvement, skin lightening or removing sun tan. There is no wow-factor in this product according to me. As I said, my experience with this cream hasn’t been bad but I don’t find that wow-thing in it which’ll make me buy it again. It doesn’t have a visible effect on fairness. Not really in terms of a fairness cream, but if you have sensitive, acne prone, oily skin like me, you can go ahead and buy this one as a daily use cream which also protects your skin against harmful radiations of the sun. This is a difficult question for me. I haven’t faced a situation like this before in my past reviews. The money you’re spending on this cream is giving you protection against sun and making your skin good but doesn’t lighten your skin which is its sole purpose. It is and is not worth the money spent but if you ask me to answer this question, keeping the sole purpose of this cream in mind, I’ll say NO! Final Verdict: This was a happy but not so happy buy for me. The quantity is going to last me really long and till that time, I am going to enjoy the goodness, the floral fragrance and nourishment on my face but once I finish this tube off, I am not going to buy it again. I hope this post was helpful to you.. Do let me know by commenting below. Don’t forget to share this post and follow my blog.. Thanks for stopping by and for that appreciation Radha ?? I have tried a lot of products from Oriflame and my overall opinion about this brand is that either their products are amazing or completely a waste of money ? That means so much to me ??? Aww$ thank you so much dear! ?